You have developed arthritis in your knee. The surfaces of your joint are no longer smooth. The bones ends are rough and the cartilage lining has worn away. As a result, your knee is painful and stiff. You will have a general or spinal anaesthetic. A cut is made about 8 inches (19.2 cm) long down the front of your knee. The damaged surfaces of the lower end of your thigh bone and the upper end of your shin bone are removed. These are replaced with an artificial joint. The artificial knee is made from metal and plastic. There are many different types of artificial knees. Some are held in with special bone cement, some are not. The surgeon will explain the type he intends to use, and the reasons for his choice. The skin is then closed up with stitches or clips. You will be in hospital for 7 to 10 days following your operation. You may go home when you can walk safely with crutches or sticks. The main aim of the operation is to stop the pain in your knee. After your operation, you should be able to bend your knee from fully straight to a right angle. As a result you will be able to walk further and climb stairs more easily. 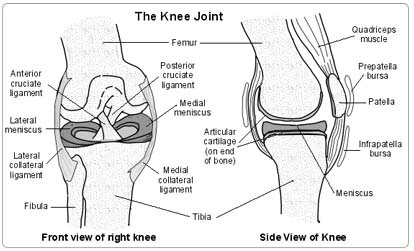 If you have become knock-kneed as a result of your arthritis, the surgeon will try to straighten your leg with the knee replacement. You should not undergo knee replacement if you have angina (chest pains) or shortness of breath that limit your walking more than your knee pain. You should not have a knee replacement if you have a urinary infection. This may result in infection of your new knee. Your urine will be tested. If it is infected, you will be given antibiotics before your operation. The same applies for any other infection, it has to be cleared before you have your operation. You should not have a knee replacement if you are a man with prostate problems. If you have poor urinary flow, it is better to have this investigated and treated before your knee is replaced. If you leave things as they are, the knee will slowly get worse. Steroid injections into your knee will not help the pain in the long term. If the pain in your knee interferes with your life and the X-rays show that the joint is severely damaged, then you should have your knee replaced. Stop smoking and get your weight down if you are overweight. (See Healthy Living). If you know that you have problems with your blood pressure, your heart, or your lungs, ask your family doctor to check that these are under control. Check the hospital's advice about taking the Pill or hormone replacement therapy (HRT). Check you have a relative or friend who can come with you to the hospital, take you home, and look after you for the first week after the operation. Bring all your tablets and medicines with you to the hospital. On the ward, you may be checked for past illnesses and may have special tests, to make sure that you are ready and that you can have the operation as safely as possible.. You will be asked to fill in an operation consent form. Many hospitals now run special preadmission clinics, where you visit for an hour or two, a few weeks or so before the operation for these checks. Your knee will be wrapped in a bulky bandage. There may be a fine plastic drainage tube running from the wound. This is to drain any residual blood from the operation. You may have a knee support on your leg to keep it still when you are not doing your exercises. The wound may be painful. You will be given injections or tablets to control this. Ask for more if the pain gets worse. A general anaesthetic will make you slow, clumsy and forgetful for about 24 hours. The nurses will help you with everything you need until you are able to do things for yourself. Do not make important decisions during this time. The physiotherapist will teach you important exercises and you will learn to walk using walking aids. The occupational therapist will show you how to do many daily tasks, such as dressing and washing. The physiotherapist may arrange for you to have therapy as an outpatient. The discomfort of the operation can make it difficult to pass urine and empty the bladder. It is important that your bladder does not seize up completely. If you cannot get the urine flowing properly after six hours, contact the nurses or your doctor. The wound will have a simple adhesive dressing over it. The nurses will pull out your wound drain a day or two after your operation. This does not hurt. Your stitches will be taken out 10 to 12 days after the operation. Wash around the dressing for the first 10 days. You can wash the wound area as soon as the dressing has been removed. Soap and warm tap water are entirely adequate. Salted water is not necessary. You can shower or take a bath once the wound has healed. You will be given an appointment to visit the orthopaedic outpatient department about six weeks after your operation. The nurses will advise about sick notes, certificates etc. When you go home, you will be able to move around the house and manage stairs. It is very important that you continue the exercises shown to you. You will not be able to go shopping for the first few weeks after you go home. Please make arrangements for friends or family to shop for you. Your knee will continue to improve for at least six months. Some people say that it takes this long for your new knee to feel part of you. You must not drive for two months after you leave hospital. You will not be able to perform an emergency stop as quickly as normal before then. How soon you can return to work depends on your job. If you can get to work without driving yourself or by using public transport you may be able to return to work six weeks after your operation. You should not do manual work after a total knee replacement. Complications occur in about 5 out of 100 operations. Wound infection sometimes happens. You will be given antibiotics to try and prevent this. You can develop a blood clot in the veins of your calf (deep vein thrombosis -DVT). A combination of medicine (injection of blood thinners), special compression stockings and foot pumps will be used to try and prevent this. Very rarely, more serious complications can occur during the operation such as further damage to the knee joint or damage to the nerves and blood vessels in or around the area of the operation and this may require another operation to deal with the problem. Artificial joints last for many years. However they can become loose and painful after years of use. A further operation may then be necessary.